FIFA 17 Companion APK 17.0.1.164399 allows you to keep up with the update of what is happening on FIFA Ultimate Team 17. As most of FIFA games, Electronic Arts develop it. Up until now, more than 100 thousand of users have already downloaded it. It is available on Google Play Store under the Sport Categories. The good feedback from its users can be seen from its 4.0 star ratings. Most of the users mention how they can organize their initial team easily. However, some of you might wonder how to use this companion app in order to update your FIFA Ultimate Team player configurations. To get started, you need to login into your FIFA 17 accounts through either game console or computer. After that, you need to select FIFA Ultimate Team mode. In this mode, you can create the club of FIFA Ultimate Team you desired. You also need to create the security question along with its answer from the interface on your game console or computer. After all of that is complete, you can go to your companion app. Log in using the same account you use previously. The companion app might need to confirm your login by using the security question. As companion app that needs to be connected with other game, this app features squad building. This feature is intended to make users easier building their squad without having to login into their console or computer account. After the squad is completely built, do not forget to submit it so that the squad configuration is updated. This app also allows you to stay update with player transfer and activity on the market. Managing club can also be performed easier from the application as well. 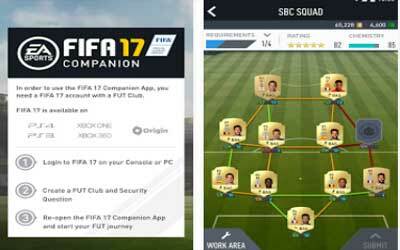 FIFA 17 Companion for Android is highly recommended for you who already have account on FIFA Ultimate Team 17. Overall, much better than last season. Very handy to access Ultimate team account while on the go. Smooth UI and very easy to navigate. I love messing with my squad without booting up the console. The squad building challenges are interesting, hope they build on that in the future. Well done!